DSC05738, a photo by milliemooshu2012 on Flickr. 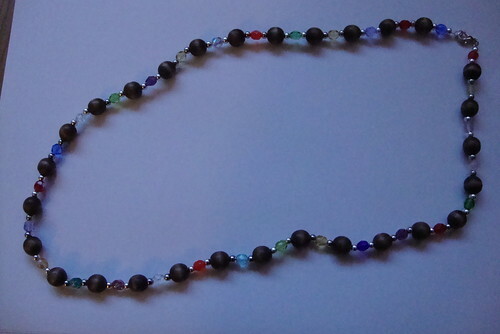 After making the Chakra bracelets I had a few crystal beads left and wanted a nice colourful necklace. I came across these lovely wooden beads in my bead box and made this pretty necklace using silver beads as spacers to highlight the vibrant colours. It glimers in the light and goes with any outfit. A great addition to my jewellery box. DSC05731, a photo by milliemooshu2012 on Flickr. I had a bag full of zips kindly given to me by my Gran. At first I wasn't sure what to do with them other than keep them for clothing and soft furnishings. 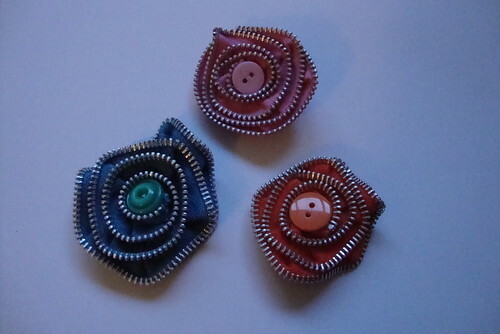 I came across them again the other day and set to making these very cute brooches. Create, a photo by milliemooshu2012 on Flickr. My Mum and her best friend had recently been on a crystal healing course and had learnt about the chakras and healing. I wont pretend to know anything about this but I did want to make them both a Chakra bracelet as a little gift. I found a few on the net but they were either way out of my price range or not to my liking. After a while I decided to make my own and luckily I came across these beautifully coloured crystal beads on sale at Hobbycraft. 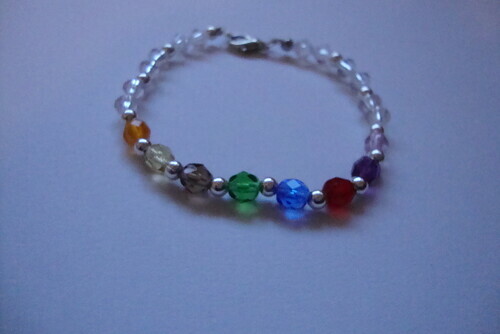 I chose the colours I wanted and made these simple yet striking bracelets using silver beads as spacers between the coloured beads. I used jewellery making thread and a lobster claw and jump ring at the ends for fastenings. I used crimps to secure the fastenings. A top tip I was told was to create a loop by feeding the thread through the crimp, then the claw/jump ring and then back through the crimp, leaving a good long end before crimping with crimp pliers. You can then make sure both threads go through the beads to make the bracelet more secure and strong. Tropical Crumble, a photo by milliemooshu2012 on Flickr. What a lovely indulgent pud during these cold wintery nights. A taste of the Caribbean at home. 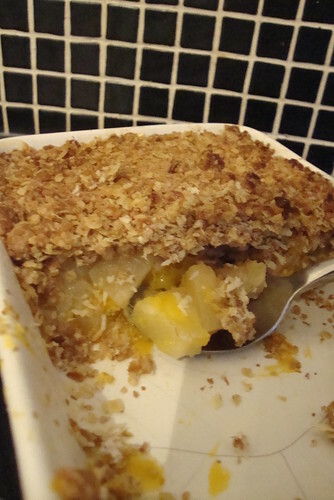 A simple crumble but with yummy mango, pineapple and desiccated coconut. So delicious that I am suprised we have any left to photo. Drain the fruit from the cans and pour into a oven proof dish, mixing a little, then sprinkle desiccated coconut. Fro the crumble mix 100g plain flour, 100g oats, 100g caster sugar and 100g butter, mix togther to make a crumble texture. Simply add some desiccated coconut and then mix. Add on top of the fruit mix. Place in the oevn and cook for 20-30 mins until golden brown. Enjoy on its own or try with some ice cream...yummy! !